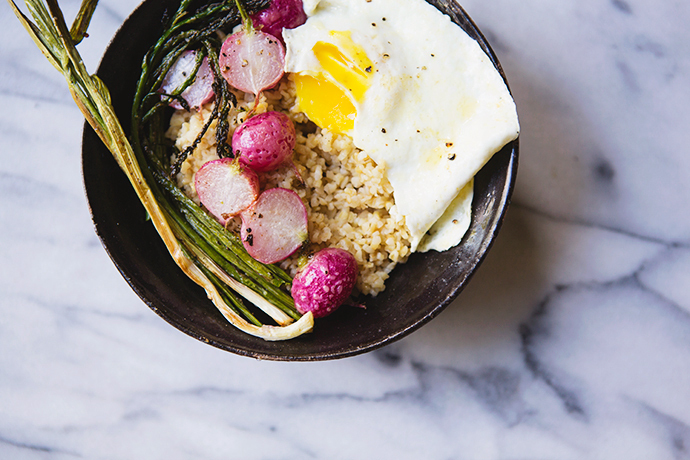 A recipe for warm freekeh breakfast bowls topped with roasted radishes, asparagus, spring alliums, and eggs that will get you ready to tackle any morning. To get to my computer I pulled a sweatshirt off the floor and slowly sank my arms deep into the sleeves, a layer between me and the chill of a spring morning. I navigated a pile of dirty clothes outside the boys’ bedroom door. I ignored the laundry waiting to be folded on the couch. To get here, I turned the world off and kept moving. The house is quiet, and I get my best work done before anyone else is awake, before the hustle of the day demands my attention elsewhere. In high school when things weren’t going well, I’d eat mugs of farina for breakfast. Hot grains spooned to the back of my throat. Something about the warm consistency of a thing that I’d enjoyed when I was small and innocent helped erase the chaos. As an adult, I return. It’s the breakfast I order in the hospital—black coffee, over easy eggs, cooked grains—whether I’m sick, post surgery, there with a child. It’s the breakfast I make for my kids when the world seems set on self-destruction. It’s the breakfast I eat to shut out everything else and just be for one small moment. 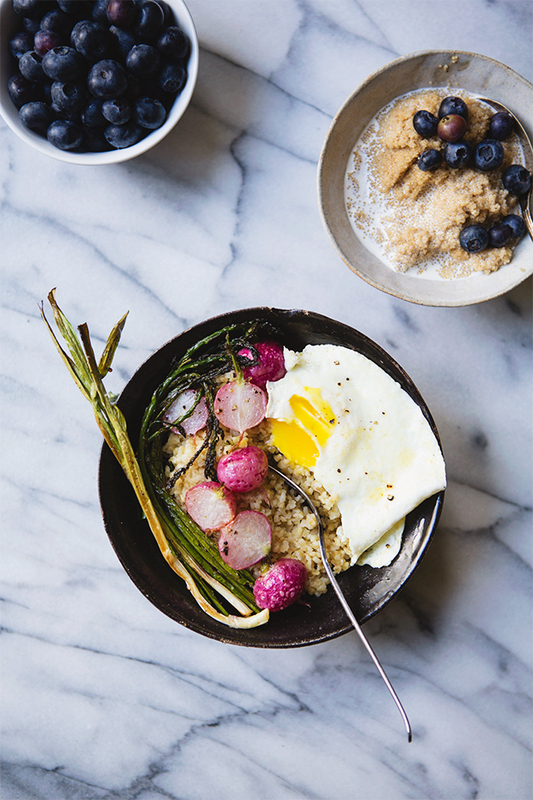 These bowls are an ode to spring, a few bits of earth-grown flavor topping off the grains and a small (but mighty) runny pullet egg. I’ve used freekeh for the base layer—a young, green wheat with a good amount of protein and fiber. I prefer cracked freekeh because the consistency is closer to quinoa and the cooking times are lower. 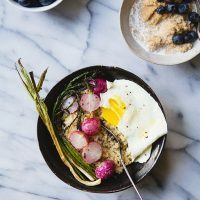 Feel free to substitute quinoa, amaranth (porridge in that bowl with the blueberries and cream), farina, grits, polenta, oats, or any other cereal or pseudo-cereal to suit your preferences. p.s. My gardens still need to be cleaned out. Anyone want to come over to help? When the freekeh (or your other cereal) is nearly finished cooking, preheat the oven to 350°F. 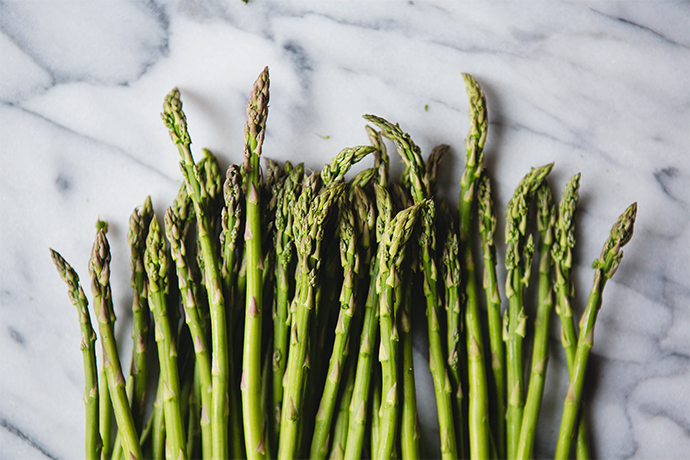 In a small bowl, toss trimmed asparagus, halved radishes, and alliums in the cider vinegar and olive oil. Spread onto a baking sheet. Sprinkle with salt and pepper (and any other fresh herb you may have available). Bake for 12-15 minutes. Prepare your eggs as desired: over easy, sunny side up, crispy, scrambled, poached, hard-boiled. (Over easy is my personal favorite.) Once the eggs are finished, brown the butter in the same pan. Add the butter to the saucepan over medium-high heat. Whisk the butter or swirl the pan so the butter melts and cooks evenly. The top will froth and foam, and the butter will turn from golden to a nutty brown. Remove from heat and allow the milk solids to rest on the bottom (leave these behind). To serve, scoop freekeh into bowls. 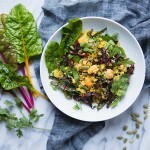 Drizzle browned butter over the freekeh. 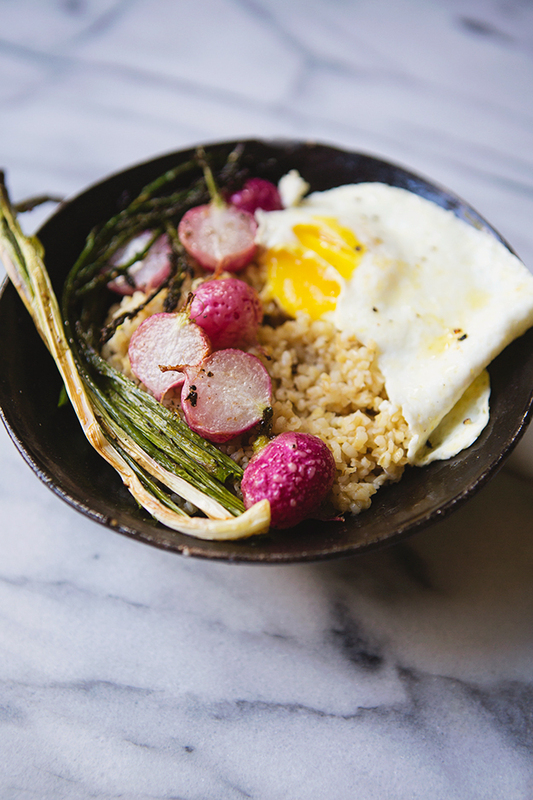 Top with roasted radishes, asparagus spears, and alliums and your egg of choice. Serve warm. 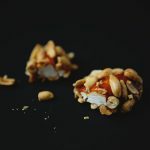 Freekeh cooking times differ by brand and cracked grain size, so read the package and prepare accordingly. 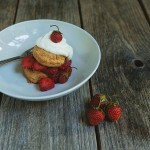 It’s that time again: Eat Seasonal. 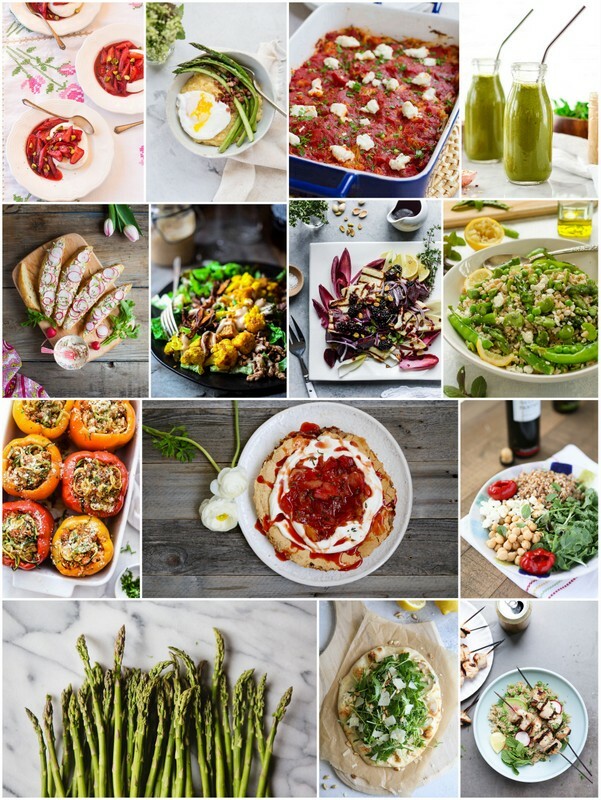 Come see what everyone’s making for the month of May, and follow along on social media using #eatseasonal. What a gorgeous Spring bowl. I love spindly greens poking out of the sides. Something very satisfying about that! I still haven’t tried freekeh. I need to change that ASAP! 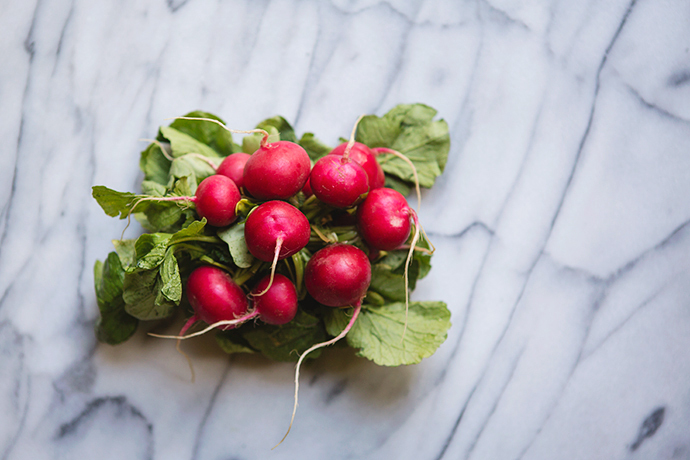 Roasted radishes couldn’t be more beautiful! love this 🙂 of course I love this… 🙂 And the millet with blueberries in the background looks great too! Never mind breakfast, I want one of these for dinner tonight!! So springy, yet comforting at the same time. 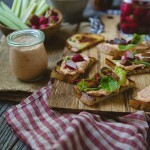 I roasted radishes for the first time this year and loved them! These bowls look incredibly delicious! 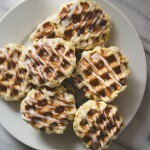 My mouth is watering at the thought of warm browned butter over porridge for brekkie! Not to mention all the other toppings. Pinned! Looks like a very delicious recipe. Yum yum yum!!! This looks SO delicious! Thanks for this amazing recipe dear i love to cook new foods. This breakfast looks delicious and probably tastes even better. 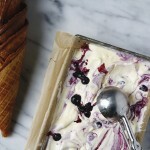 Definitely, something I will try to prepare on Sunday morning. It seems to be very healthy breakfast. Thanks for sharing with us. I think it will take the place of my breakfast bowl. Thanks for this dear.